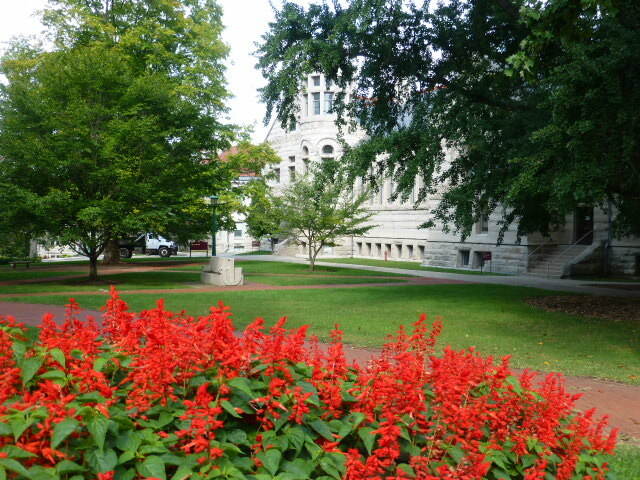 For a large state/Big 10 School, IU is wonderfully landscaped and attractive. There’s a stream through campus, lots of trees, and even 2 cemeteries (the university can’t move them because of purchase conditions of the property). Near the chem building is the Dunn Family Sweetheart Tree, named for the family who had sold the university the land for that part of campus. One stipulation they made during the sale was that this tree had to remain on campus. The new chem. building is built around the tree. The 2nd stipulation was that for every tree cut down, the university has to replace it with 1 more, but they went one better and replaces every lost tree with 2 more. 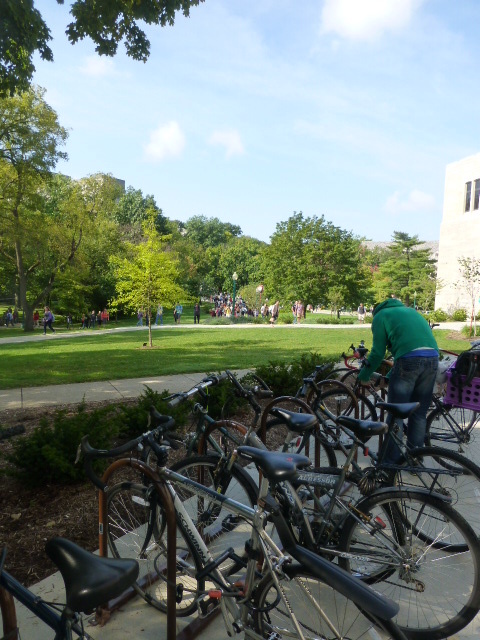 The main part of campus was swarming with students moving between classes. During the student panel, someone asked the students what it was like getting around campus for the first couple days and how they avoided getting lost. One student said that there are “IU Guides” – upperclassmen — who are posted around campus for the first couple days to help people. There’s also a mobile app. 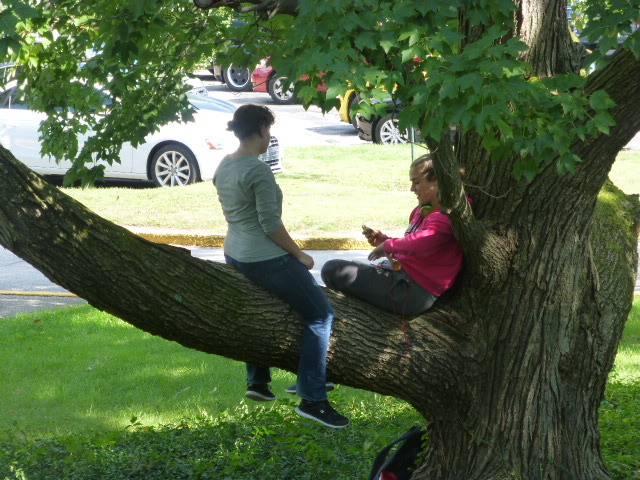 “I could look like I’m texting instead of a lost freshman,” said another student. There are also buses that circulate every 7-10 minutes which helps get them where they need to go. With 4,000 classes each semester, students can’t possibly be bored. Average classes have 33 students, and only 7% of classes have more than 100. The largest lecture hall holds 420 students. “It’s the smallest largest lecture hall in the Big 10!” said the tour guide. Her largest class was close to that number. Despite the size of campus, professors make sure the students get hands-on experience. This is not the place for students who don’t like group work. The Kelley Business School, ranked the #7 Business program in the nation, has about 5000 undergraduates. The program is designed for students to explore options through a first-year 12-credit Integrative Core to help them choose from the 12 programs including: Professional Sales, Economic Consulting, Public Policy Analysis, Real Estate, and Supply Chain Management. Co-majors include Law, Ethics and Decision-Making, Technology Management, and Sustainable Business. The music program competes with Eastman and Julliard. Thy have a full opera company which performs at the Met. Students have to audition and submit materials by 12/1. There’s a pre-screening process in the popular areas such as violin, saxophone, voice etc. There are more languages taught here than anywhere else in the country with a total of 70, 50 of which are taught on a regular basis. Physical Sciences are some of the smallest majors (and tend to have the smallest classes). Many majors offer direct admission, and 26% are directly admitted into the program of choice. Students need to indicate on the application that they want that major. A Chemistry Building window carving. Nursing and Social Work are not direct admits. Students interested in theater or studio arts can apply for the BFA program (requires an audition or medium-specific portfolio) or a BA (no audition/portfolio). The Chem building is shaped like the periodic table. The elements are carved under the windows with a few blank for future discoveries. IU admitted 24,000 students from the 38,000 who applied last year. 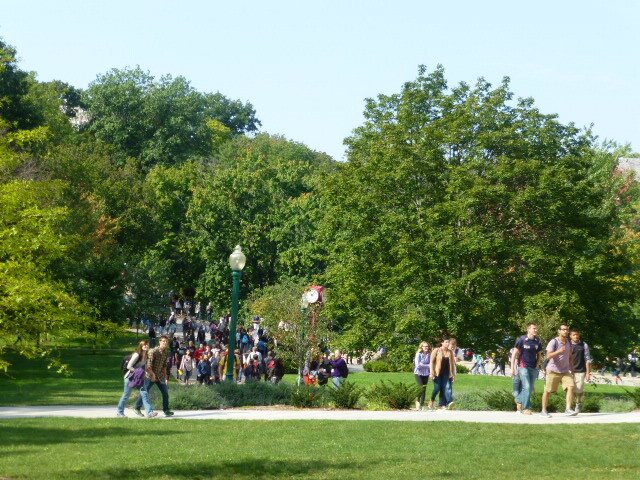 From that, they enrolled 7716 first-year students, the largest in history. About a third came from outside Indiana; 9% were international. Students had a 3.73 median GPA and 1216 average SAT. They admit on a rolling basis (answers take 4-6 weeks). The Dean’s scholarship is worth up to $8,000 and given to non-residents. The Global Engagement Scholarship for incoming freshmen, up to $11,000. Students are invited to the Honors College with an SAT of 1450 or 34 ACT, and a 3.8+ GPA. Honors housing is available but not required. Not surprisingly, sports are huge here. “We bleed Crimson . . . which isn’t so impressive come to think of it,” said one student on the panel. When IU last won the NCAA, the Arts Plaza got flooded during the celebration. The fish from the fountain were taken (“They weigh about a ton each. I don’t know how that happened,” said the tour guide. Although 4 were found (one of which was on a roof! ), the 5th fish is still missing. There are several legends surrounding this: one says that it won’t be brought back until Bobby Knight apologizes, “and that’s not gonna happen!” Another says it’s gone until IU wins again.